PT Yamaha Indonesia Motor Manufacturing (YIMM) released its newest motor sport product, Yamaha new R15 2018. Interestingly, this brand-new model added upside down front suspension gold color. 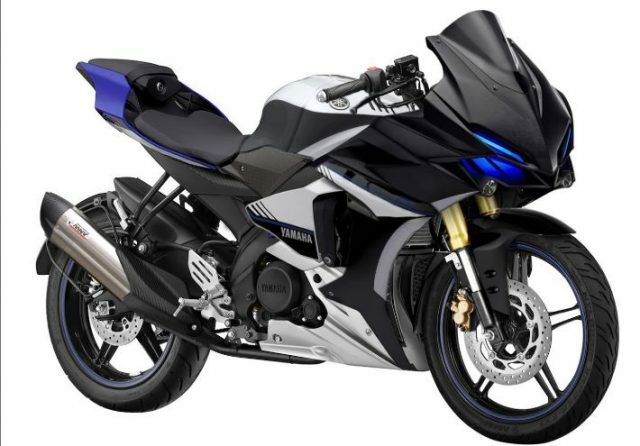 Minor changes (minor change) for this new motor sport berpairing to beautify the look of this competitor CBR150R motor has been seen on the official website of Yamaha. In addition, the 150 cc sport bike is also present with a new color, which increasingly increasing the choice for consumers who will ask for her hand. Yamaha New R15 comes with several new colors: yellow racing, blue racing, black and red racing. As for the engine there is no difference compared to previous versions. Yamaha R15 2018 still uses SOHC 4 valve VVA engine that generates power up to 19.3ps at 10,000 RPM and 14.7NM of torque at 8500 RPM. The engine used is the latest technological innovation that will ensure the torque will be evenly distributed on every engine speed. In addition, in the transmission sector, this bike has been equipped with Assist & Slipper Clutch devices that make the gears more smooth, ranging from lower teeth to upper teeth, and also sebaliknnya. But comparable with the changes, making the price of All New Yamaha R15 dibanderol is quite expensive in its class. "This is a good motorcycle to drive, with full SD feature, clip slipper assist, iconic LED lights, and assymethrical engine," said Valentino Rossi, Yamaha rider at the launch of this bike. There is no official comment from the YIMM, but the change of color and new look of the R15 is an effort from Yamaha to maintain the market in the motor sport fairing segment. Since this bike was released with a new look and engine, the sales of R 15 in the segment sporting a good enough. AISI data (Association of Indonesian Motorcycle Industry) in 2018 noted that sales of All New Yamaha R15 in January increased when compared to December 2017. If in December 2017 then sold only 2791 units, but in January 2018 this motor sold up to 5,061 units. This figure beat the sales of its competitors namely Honda CBR150 which January sold 4,642 units. Another competitor, the Suzuki GSX R150 sold 2,330 units. In addition to the distinctive color difference in the motor version of 2018 is the use of USD Kayaba front suspension is golden. YIMM membanderol Yamaha New R15 version 2018 is Rp 35.2 million OTR Jakarta.